In 1938, the Mint expanded the theme of honoring heroes from American history on circulating coinage by sponsoring an open competition for a new Jefferson Nickel. Earlier honorees were Lincoln (One Cent, 1909) and Washington Quarter Dollar, 1932). The main guidelines of the competition were that the obverse must contain an “authentic portrait” of Thomas Jefferson and the reverse, a rendition of Jefferson’s beloved Virginia home, Monticello. Of the 390 models received, the winning entry was submitted by Felix Schlag, a German immigrant who came to the U.S. nine years earlier. Schlag was awarded a prize of $1000. Schlag based his image of Jefferson on the 1789 marble bust crafted by the renowned French sculptor Jean-Antoine Houdon, considered by many to be the most superb likeness of Jefferson ever produced. Schlag’s three-quarter view of Monticello was rejected by the Commission of Fine Arts, preferring instead a frontal perspective of the building. Schlag implemented these and other revisions, and by November 1938, the Jefferson Nickel entered circulation. The challenges of World War II necessitated a change in the metallic composition of the five cent coin. Nickel was an essential element for armored plating, so Congress required its removal from the coin by October 8, 1942. For the remainder of 1942 through the end of 1945, wartime Jefferson Nickels were composed of 56% copper, 35% silver, and 9% manganese. War nickels were readily distinguishable because all three mints in operation at the time, Philadelphia, Denver, and San Francisco, placed huge mint marks above the dome of Monticello. An example is shown directly above. This was the first appearance ever for the “P” mintmark. In 1946, the prewar composition of 75% copper, 25% nickel was resumed and continues to the present day. In 1966, the initials “FS” were added to the Jefferson Nickel to properly credit its designer, Felix Schlag. The recognition might have never occurred were it not for the movement sprung by the popular periodical, Coin World . The initials were placed below the bust of Jefferson. The appearance of the Jefferson Nickel underwent numerous changes beginning in March 2004, when the Monticello reverse was replaced by a depiction of the Peace Medal carried by the Lewis and Clark Expedition. Later in 2004, the reverse was changed again to show the famous explorers in their keelboat. Monticello was returned to the reverse in 2006. The portrait of Jefferson, based on the 1800 Rembrandt Peale painting, is shown as a frontal, full face view. It is the first U.S. circulating coin depicting an historical figure facing forward. The Jefferson Nickel was not the only icon to be introduced into American society in 1938. That year also marked the debut of Superman, the first comic book superhero. Nearly everyone is familiar with the story: He came from the doomed planet of Krypton, where he was named Kal-El. His parents rocketed him into space just as Krypton was destroyed. Kal-El crash landed on Earth outside the town of Smallville, where he was rescued and later adopted by a kindly farming couple, Martha and Jonathan Kent. They named their new son Clark, and raised him to become a virtuous young man of high integrity. Along the way, they discovered he possessed great powers far beyond those of mortal men. Following the death of his adoptive parents, Clark resolved to use his super powers for the benefit of humanity, and thus began his career as Superman, in pursuit of "truth, justice, and the American way". 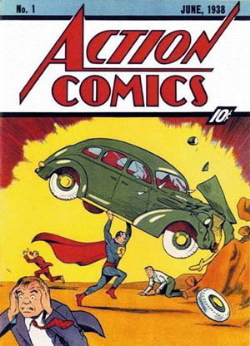 The cover shown above is the first comic book featuring the Man of Steel, published in June 1938. By all accounts, Thomas Jefferson was a remarkable American, earning accolades as an architect (Monticello was his brainchild), scientist, and philosopher. It was his accomplishments as a statesman, of course, for which he is best remembered. He began his life of public service at the age of 26 by joining the Virginia House of Burgesses in 1769. Following the onset of hostilities with Great Britain in 1775, Jefferson joined the Second Continental Congress. His reputation as a gifted writer prompted his selection as the chairman of the committee to draft the Declaration of Independence. Jefferson is regarded as the primary author of the venerable document, approved on July 4, 1776. Two months later, Jefferson was elected to the Virginia House of Delegates. From 1779 to 1781, he served as Virginia governor, overseeing the transfer of the state capital from Williamsburg to Richmond. As a member of the Continental Congress in 1784, Jefferson proposed that the nation’s monetary system be based on the dollar, for it was a unit most Americans were already familiar with (see Spanish Pillar Dollar). Jefferson devised a simple decimal system, espousing the relative ease of multiplication and division by factors of ten. The primary points of Jefferson’s plan were adopted in the Mint Act of 1792, which created the Mint and marked the beginning of United States coinage. After a stint as minister to France, Jefferson returned home to become the nation’s first Secretary of State in 1789. He soon clashed with Alexander Hamilton over fiscal policies, a rift that motivated Jefferson to organize the Democratic-Republican Party (the predecessor of today’s Democratic Party) to counterbalance the influence of Hamilton’s Federalist Party. Jefferson first sought the presidency in 1796, but came in second to John Adams and thus served as Vice President, as prescribed by the Constitution as originally framed. Jefferson ran again in 1800, but when votes of the Electoral College were tallied, Jefferson was tied with Aaron Burr, sending the election to the House of Representatives to decide the winner. After 35 deadlocked ballots and no resolution in sight, Jefferson’s longtime nemesis, Hamilton, convinced his fellow Federalists to support Jefferson because he was "by far not so dangerous a man" as Burr. On the next ballot, the House gave Jefferson enough votes to become the third President of the United States. Thomas Jefferson served two terms as president, from 1801 to 1809. Major events during his tenure included the Louisiana Purchase, the Lewis and Clark Expedition, and the war against the Barbary pirates to preserve freedom of the high seas. Jefferson’s presidency was guided by his philosophy of limited federal government. Following his presidential years, Jefferson remained active in numerous walks of life. In 1812, he struck up a correspondence with another of his onetime political rivals, John Adams. As the exchange of letters continued, the two men forgot about their past disputes and became good friends and confidants. It was during his twilight years that Jefferson scored his proudest accomplishment – the founding of the University of Virginia, in 1819. He shared with close friends that the school was the culmination of a dream he had harbored for many decades. Thomas Jefferson died on July 4, 1826, exactly 50 years to the day after the signing of the Declaration of Independence. His friend and Declaration co-signer, John Adams, died a few hours later. Ironically, two of the most important Founding Fathers were forever claimed by the pages of history on the 50th birthday of the nation they helped establish. 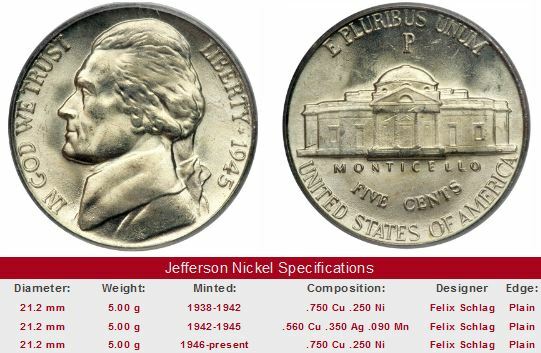 Collectors desiring to buy Jefferson Nickels with the potential for significant future price increases should first look at key date coins in MS-66 or better condition, especially those with "full steps". Abbreviated as "FS", this refers to the detail on the steps leading into Monticello. The vast majority of Jefferson Nickels, up until the late 1980's when the relief was lowered to improve strike sharpness, lack clear separation of the steps. To qualify for the "FS" descriptor, at least five steps must be clearly visible. The "FS" phenomenon is a fairly recent development in numismatics, so there is sketchy data on long term value trends, but from all evidence thus far, the supply of full step nickels is truly limited. Hoping to capitalize on this apparent scarcity, some sellers have lax standards when assigning the "FS" descriptor to their Jefferson Nickels for sale. To best protect yourself, it is smart to buy only certified full step Jefferson Nickels. The most widely respected certification companies are PCGS, NGC, ICG, and ANACS. The links below are set up to search eBay for those key date Jefferson Nickels in MS-66 "FS" condition. There is a "Sales Box" for each coin from the key date list. The left hand side of each box reports value trends since 2003 for the indicated key date. The percent annual increase since then is computed for comparative purposes. As mentioned above, its a good idea to consider only certified full step Jefferson Nickels by either PCGS, NGC, ICG, or ANACS.